Anyone with kids know that toys are every expensive. From the day babies are born, you spend money on one thing or another. Of course how much you spend is up to you but there are basics you need to have. Anyway, once having Chhori, we discovered that toys for kids are quite expensive. Before, we used to buy them as gifts so we didn’t think much as we are buying one at a time but now we need to buy more often and they need to be age appropriate too. While we were growing up in Nepal, we didn’t have that many choices of toys and I used to go out and play a lot with other kids. But kids these days seem to stay inside and play with their toys a lot more. We definitely wanted Chhori to have the necessary toys for her development as every parent wants their kids to be smart. Chhori is definitely lucky that she has got amazing and loving people around her who bring so many toys for her. She has an accumulation so many toys already and she is just 1. But in the last one year, I have discovered that, a kid doesn’t always need expensive toys. They are happy with an empty bottle too. Anything new is interesting to them. 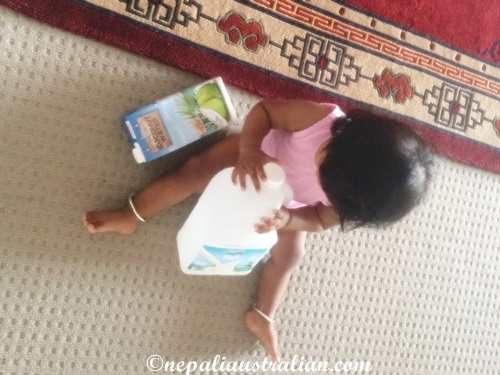 Despite having so many toys, I see Chhori spending hours playing with and empty milk bottle or juice carton or take away boxes. When she was smaller and couldn’t open boxes, I used to put a spoon inside a take away container so it rattled and she used to love it. This has made me question how many expensive toys should we buy her in the future? Until she can ask (demand is probably the right word) for toys herself, I am thinking to keep them to a minimum so that she can explore other things and use her imagination as well. What is your opinion on this matter? How often do/did you buy toys for your kids? Is there an age where they need to have certain toys? 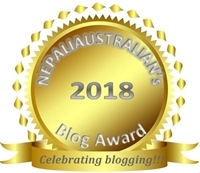 This entry was posted in Being Mum and tagged baby, chhori, fun, M from nepaliaustralian, mum, my daughter, Nepaliaustralian, toys. Bookmark the permalink. I can see similar situation at my home. Earlier me and my wife (or rather me only as wife acted more maturely 🙂 ) used to buy some expensive toy like remote control cars etc which would last for couple of days (till battery lasted) and then turn into waste. Now we look for more creativity. We have seen there are toys (our sons are 9 & 5 years old) which are very reasonably priced (arnd Rs 100) but are extremely good from utility and entertainment point of view (last we bought some playing cards containing different characters with points given for various attributes like bravery, speed, intelligence, weight etc, we could all play them and enjoy a lot) and such this way we could go for something new every month. So young kids can’t really handle so many toys in the beginning. Sure Nathan also has tons of stuff but we always give him a small amount at once and circle them few times a months so he is able to enjoy all of it over time.